Biljana Gjoneska, M.D., Ph.D., holds a medical degree from the University of Skopje and a doctoral degree in psychology and social neuroscience from the Sapienza University of Rome. 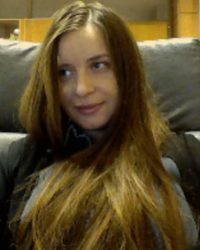 While her work as a scientific researcher at the Macedonian Academy of Sciences and Arts revolves around the area of Cognitive Neuroscience (with special emphasis on Neuroinformatics and Neuroethics), her research at Sapienza involved the areas of Social Psychology and Social Neuroscience (with special emphasis on Neuropolitics). Specifically, she was interested in neurophysiological and behavioral correlates of ideological division and group distinction. Her doctoral thesis titled “Plasticity of Trustworthiness in Ideological Context” aimed at the investigation of decision-making processes that are mediating ingroup/outgroup un/trust, and may serve as an underlying mechanism for the creation of conspiracy theories. For contact and additional information see here.